1 So, What Are CFLs? 2 Why Should You Use a CFL Grow Light? 6 How Many Bulbs or Watts Do I Need? When I first started growing plants indoors and in hydroponic systems, I had no clue what I was doing. I decided to start with the cheapest, most basic types of light out there: compact fluorescent bulbs, or CFLs.​ They’re a great starting light for beginners because they’re cheap, easy to find, and do a damn good job of growing many different types of plants. CFLs were designed to replace the classic incandescent lamp, ​also known as the lamp that Thomas Edison reportedly failed 10,000 times to create before finally succeeding. While incandescent bulbs were amazing, the simple fact is that they burn hotter and waste quite a bit of the electricity we use to power them – putting out 90% as heat and 10% as light. On the other hand, CFLs can last up to 10 times longer than incandescent bulbs and put out less heat. They also take less wattage to deliver the same amount of lumen output as incandescent bulbs. Why Should You Use a CFL Grow Light? ​There are a lot of reasons that beginning and expert gardeners alike turn to CFLs instead of higher-cost lights like high pressure sodium, metal halide, or expensive LED systems. As far as gardening is concerned, there are two main types of CFLs that matter: soft white and daylight. 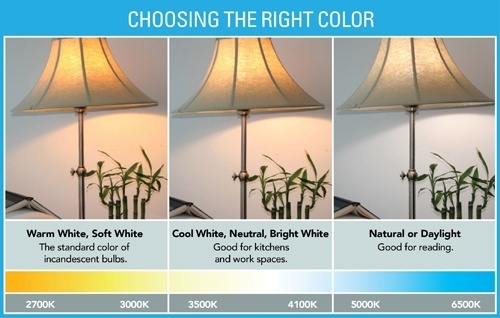 The main difference between these two types of bulbs is their color temperature. Color temperature is an extremely important characteristic of lighting for growing plants, because plants require different temperatures of light for different phases of their growth. For this reason, you should always be using a mix of both types of bulbs if you’re growing with CFLs. Without both, you’ll be starving your plants of the type of light they need to thrive throughout their entire growing cycle. The daylight bulbs are the kings of the vegetative phase of plant growth. This is the phase where plants are putting out a lot of leaves and growing quickly in anticipation of their flowering phase. Daylight bulbs and lighting fixtures are the optimal choice for the beginning phases of a plant’s life cycle for this reason, and the save quite a bit of power over using a high pressure sodium or metal halide system during the vegetative phase. You can also place them quite a bit closer to your plants than you could a lighting system that puts out more heat, so your plants won’t get burned, and the stems won’t stretch out, weakening the overall health of your plants. Bulbs in this range are in the middle ground, and are often not very optimal for either the vegetative or flowering phase of a plant’s life cycle. I recommend staying away from lights in this range, or just using 1-2 in supplement to bulbs in the other two ranges. Bulbs in this range are optimal for the flowering phase of a plant’s life cycle. This warm light mimics the state of the sun when most plants are flowering and spreading their seed for another generation of plants to begin growing. You have two options when you’re growing with CFLs: use separate bulbs and build your own system, or go with a lighting fixture. Ignore the replacement watts and look at the true wattage – this is what you want to base your buying decision on. 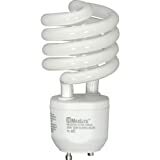 The Sun Blaster 26W (2700K) is the best soft white CFL bulb right now. It’s a bit pricey, but quite efficient and does a great job during the flowering phase for most plants. Keep in mind that you’ll need to buy at least 4-5 of these to get enough light intensity to actually produce flowers and fruits on your plants. The MaxLite 26w is the best daylight or vegetative CFL bulb right now. MaxLite is a long-time favorite of mine due to their consistency in putting out high-quality products. You’ll need at least 4-5 of these to have enough light output for a quality vegetative phase, but it’s worth the money as these are relatively cheap. For many people – beginners especially – it makes more sense to go with a CFL fixture. They’re already setup for you so you don’t have to connect a bunch of bulbs together to get your garden going. This saves you not only a lot of time, but a good amount of headache and frustration if you’re not used to building your own lighting setups…and let’s be honest, most of us aren’t familiar with that skillset. If you’re just starting out, the best CFL grow light on the market is the Agrobrite 2′, 4-Tube T5 Fixture. It comes with four 2″ long T5 bulbs in the 6500K range – perfect for getting plants through the vegetative phase of the growth cycle. Because it doesn’t come with any 2700K bulbs and you will eventually want your plants to flower (unless you’re only growing leafy greens), you may want to pick up some extra 2700K bulbs so you can switch a couple out once your plants are ready to flower. Dimensions: Length - 22.12" / Diameter - .62"
Apollo Horticulture offers an affordable pack of four 2″ T5 CFLs in the 2700K range. For even more recommendations, see my T5 Grow Lights Guide. How Many Bulbs or Watts Do I Need? There’s no good answer here for every situation, so the general rule of thumb is that more light is better. I like to start at around 100 watts per plant that I am growing, but some plants require less light. For example, if I’m setting up an indoor lettuce garden, I wouldn’t need as much light because lettuce is a fast-grower that only goes through the vegetative phase (we don’t eat lettuce flowers). Remember, these suggestions are based on true wattage, not the incandescent equivalent that most CFLs are advertised with. You’ll be able to tell if you need more light in your garden if you have underwhelming growth in certain areas on your plant, or if your system isn’t adequately covering all angles of the plants. Now that you know just about everything you need to know about CFLs and you’ve got some for your garden, let’s learn some best practices. 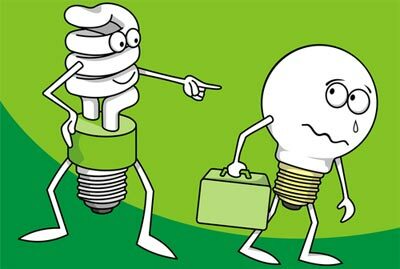 CFLs have a major advantage over other types of lightbulbs in that they plug into normal light sockets. They also come in various shapes and sizes, so they’re endlessly customizable. Take this into account when deciding how to arrange your CFLs. Light is emitted from every angle of the bulb, so to get the most out of them try to have as much of the bulb pointing at your plants as possible. For the spiral CFLs that I have recommended, a lot of light comes off of the sides as opposed to the front, so you may want to align the sides facing the plants instead of a traditional top down setup. Try to keep your lights anywhere from 4-6 inches away from the surface of your plants. Read up on the inverse square law for light if you want to understand why. Because a lot of the light in any lighting system is pointed away from a plant, gardeners use reflectors to harness this wasted light and redirect it toward their plants. If you don’t have a reflector, using aluminum foil, white paint, or panda paper are also good alternatives. I hope this was a good primer on using CFLs bulbs for hydroponics, aquaponics, or any other type of gardening! Thank you for the guideline. I also read all the comments which are very useful. I would like to ask more specific suggestion added on. I live in a townhouse and I want to grow some foliage houseplant in a west-face room including ivy, peace lilly, pothos, spider plant, jade, swedish ivy, and zz. I will also plan to put some outside plants in this room during the winter ex. Cactus, croton. The problem is that there is a big tree blocking the window. There is some sunlight come through but not full. I plan to place the Hydrofarm Agrobrite FLT24 T5 Fluorescent Grow Light System, 2 Foot, 4 Tube on the ceiling as a support to the sunlight. You mention that we should place the light 4 feet from the plant. In my case, since there is already some sunlight and all my plants are houseplant foliage, can I place the light on the ceiling? If it’s not enough, can I have 2 sets of the hydrofarm light to add it up? If this is not going to work, do you have any other ideas I can make this happen without hanging the lights 4 feet from the plant? That should work OK, though I would play around with the placement and see how your plants respond. Love the idea of supplementing due to the tree! I am trying to liven up our basement bathroom with plants on the walls, it has one ground level window that is not enough light. The cooler temp also makes for a white dust (mold?) form on top of soil. Will a CFL Grow Bulb in the ceiling be OK? It’s enough for human eyes but curious of your opinion for plants, thanks! I have recently moved house and while most of my plants have adjusted, one of my succulents (Escheria) is stretching and is in need of more light. We’re coming into winter soon where I live, and I’m worried that it will suffer as the natural light continues to decrease. Would a CFL help to supplement the natural light, and how many hours a day should I leave it on for? Definitely would. I would recommend placing it as close as possible without burning the plant, and leaving it on around 16 hours a day. So 16 on, 8 off. Hello Kevin, nice to meet you. I have two grow lights already and most seedlings are growing very well. But I have another tray that needs grow lights. The cost of a ferry brand is !early $40. So I have set up the third tray with an ordinary 13 watt halogen spiral bulb. I think it is a cfl. What do you think will happen. The tray for now is only 12″ x 12″ . great guide, I was wondering what kind of light do you suggest for succulents, should be warm light or not, either way can you suggest me a not expensive bulb as start. Succulents will want warmer lights for sure, mimicking the longer days in the climates where they naturally grow. This isn’t a rule across the board, but a good rule of thumb! I just want to keep my plants alive during the winter months. In that case, which grow light wood you recommend? Hello, I have recently acquired many large house plants and in my apartment I only have one big window with good sunlight.. but too many plants to fit in it! I had wondered if replacing all my lightbulbs with CFL bulbs in my light fixtures would help the plants get enough of the light they need? Would mixing daylight and softlight bulbs be good, or since mostly they are all types of foliage is just daylight sufficiant? Would I need to keep the lights on all day for them? The light fixtures are all on my ceiling, is that too far away from the plants? Sorry for so many questions, I just want to be a good plant mother! Since you’re only growing foliage, you only need daylight (vegetative) bulbs. But it really depends on the type of plants! What are you growing? I honestly do not know what any of them are! I could post a photo, but they are all just large leafy bush/tree like plants, no flowers.. except for a Christmas cactus which I believe will flower in the winter? Do you think just having the daylight bulbs in my light fixtures will be enough to help them? Thanks Tony. Tomatoes require a lot of light and often don’t perform well with CFLs only. They need a ton of CFLs as compard to a HPS or MH lighting system. My recommendation is to move them outside if you can, and if you can’t to look into some of the different types of hydroponic lighting. I know I’m way late to the discussion, but if you put some lights on the sides of your plant, that would help as well. CFL light doesn’t penetrate well and the useful range is less than other types of grow bulbs. Good tip, that definitely helps. When I started to grow I did so on a window sill. The Tomatoes reached for the sunlight causing them to be “leggy” I now started over with a full spectrum flourescent bulb x2 and a flourescent on the red spectrum. I keep the tops of my plants ( whatever I’m growing ) 3 inches under the lights ..always. This causes the plants not to reach too far therefore not become leggy . hope this helps. Also get a light that’s 5k-6.5k that will mimic the sun’s light as closely as possible. Very important for beginning seedling growth. Hi. Very nice guide indeed! I am running experiment in my room and I was wondering what you would recommend. I am growing potatoes, carrots and different kind of lettuce including radish (all in containers). I can build my own lighting fixture. So, If I followed your guide, the vegetables I am growing dont have a flowering phase, am I correct? how many hours of light the vegetables need? Sounds like you’re growing all root veggies, right? I haven’t grown root veggies indoors, usually because they take so long and are pretty cheap to purchase. But you are correct in that they don’t have a flowering phase! I wish I could be of more help, but I just haven’t grown those indoors! Keep me updated though! Is it alright to use 2900K and 6500K at the same time? Will this provide any benefit, or just confuse the plants flowering and vegetative growth? No, you can do that if you like. Oftentimes growers will transition slowly over to the warmer lights to mimic a smooth segue as the seasons change.